At GABS 2015, I was sipping on an Oatmeal IPA at the Wayward beer stand and chatting to Wayward founder Peter Philip, who was preparing to open their Camperdown brewery venue later that year. As a home brewer of many years, Peter generously shared some sage advice on all manner of things to help me in my fledgling home brewing career. Since then, while my home brewing hasn’t really taken off, I’m glad to say that Wayward’s brewing operations have gone from strength to strength. The Wayward indeed opened its brewery venue in Camperdown to the public later that year and it has since become a beloved venue at a time when having a taproom is key for independent brewers. 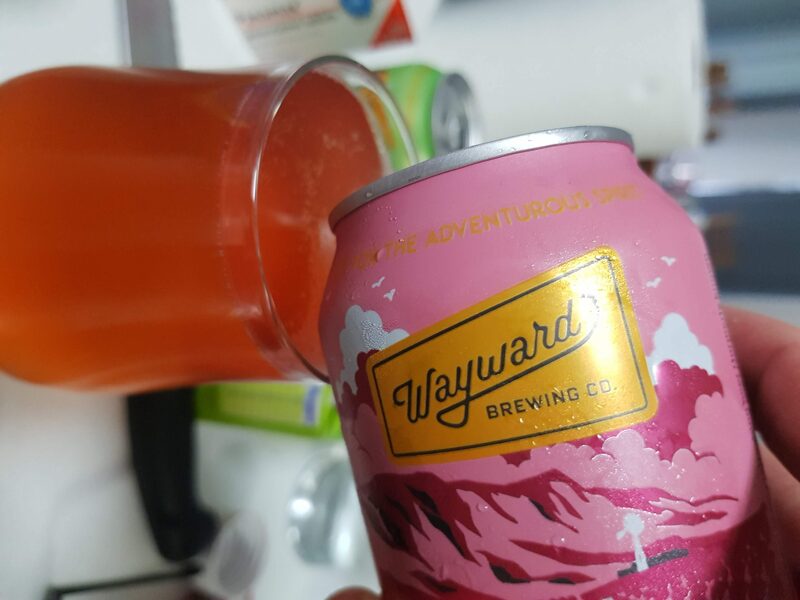 From there, Wayward increased their bottling production over time to distribute their range of highly drinkable but still interesting beers like the Charmer Red IPA, the aforementioned Oatmeal IPA, Oatis, and Sourpuss, a Raspberry Berliner Weisse. They have sent these beers across New South Wales and further afield to the delight of beer lovers. Last week, Wayward launched its latest series of beers representing the next step in the evolution of Wayward’s journey. These brightly coloured beer cans are adorned with the tagline “Beer for the adventurous spirit” and their slick vibrant design is set to pop on shelves and demand attention from beer drinkers who are increasingly turning to tinnies. The four styles on offer in this new range are: Pilsener, Everyday Drinking Ale, IPA and a Raspberry Berliner Weisse. I was fortunate enough to receive a pack to test out the new range and kicked off with the IPA, a repackaged and modified version of the Oatis IPA that I’d tried at GABS those years back. I’m pleased to say it’s still a really enjoyable IPA with an assertive bitterness, a lovely bouquet of hop aromas, and a unique touch, perhaps from the oatmeal, that makes it just that little different to your average West Coast IPA. It was certainly fresh as too, so all in all was one of the IPAs I’ve enjoyed most in recent times. The Everyday ale is a more sessionable but still solidly hoppy pale ale. The Pilsener was a bit light on for my taste but would play to a certain audience. While the Raspberry Berliner Weisse is indeed a remix of their beer formerly known as Sourpuss, which I’ve long revered for its thirst quenching qualities and even added as a core beer for my fictional best-of-Australia brewery. Wayward continue to go onwards and upwards and they’ve hit the mark again with this latest series of beers that are squarely aimed at today’s beer lovers.